Moving goods by cargo bike. That's one of the many aspects of Copenhagen bicycle culture. Now we get to promote it head on for the next three years under the European Union supported project, CYCLE Logistics. At Copenhagenize Consulting, we are thrilled to be a part of this promotion. We're honored to be a part of the team and super excited to work towards building cargo bike culture. 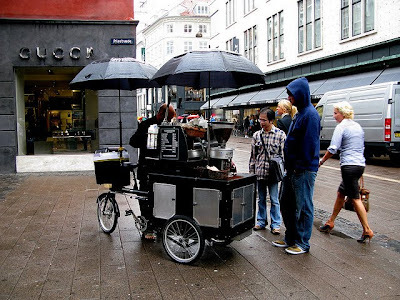 As the main Danish stakeholder, Copenhagenize gets to host the kick-off meeting from May 16th- May 20th. 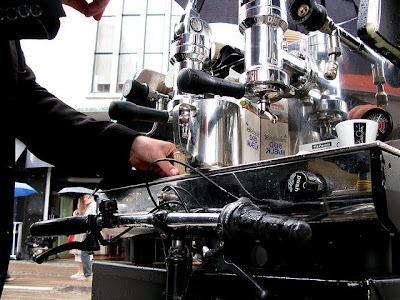 With services from catered coffee and lunches to electricians, all via cargo bike, we'll introduce the other partners to the endless number of goods and services deliverable by bicycle. Ole the espresso man on his custom Sorte Jernhest cargo bike. 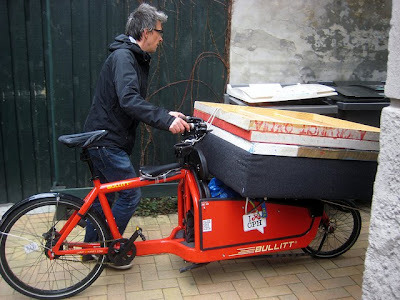 The European Cyclists' Federation (ECF) issued the press release, in it stating, "CYCLE Logistics will push for behavioral change across a broad spectrum of stakeholders: individuals will be informed on how to use their bicycle to transport goods usually moved by cars, businesses (e.g. tradesmen, window-washers or plumbers etc.) will be motivated to use bikes or cargo bikes for delivery, with the goods sector being pushed to increase deliveries by cycle. Towns and cities across Europe will have a role to play, replacing their unneeded motor vehicles with cargo bikes to provide municipal services (e.g. street cleaning, park maintenance)." 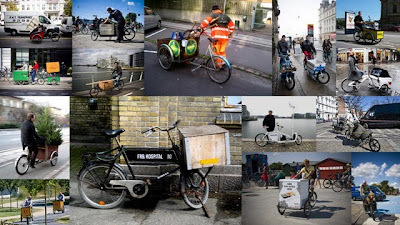 Copenhagen has a significant number of cargo bike users already, so along with increasing that amount, we're using this opportunity to implement super-innovative-spoil-our-cargo-cyclists campaigns. Here is a slideshow of some of the many creative cargo bike entrepreneurs we're promoting and catering to with CYCLE Logistics. Here's the full CYCLE Logistics press release (opens as pdf).